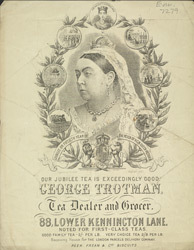 This leaflet is advertising George Trotman, Grocer and Tea Dealer. It features a large portrait of Queen Victoria encircled with smaller illustrations of significant events that occurred during her reign. 1887 was the jubilee year of her reign and there were many celebrations. There were dances and balls held in every town and a public holiday was declared so that everybody could watch a parade through London. Many shop keepers and business men produced goods named after the Queen. In this case it is the tea that has been named ‘Jubilee Tea’.